If you caught The Wire and Save Me getting plenty of radio play over the Summer, and seen three rock chicks playing instruments with great attack and verve at Summer festivals: that’s Haim. So debut album Days Are Gone may come as a surprise. Filled with lots of catchy tracks and very cool tunes, it is polished mirror-bright by slick studio production that renders it a compendium of 80’s pop. Haim’s live trademark of rock’n’roll guitars and ’90s R&B harmonies is mutated to straight power pop, full of ’80s synth trills and big drums. The essence of a break-up album, Days Are Gone is less about men and more about a modern woman’s search for independence. Upbeat, and with a lightness of touch reminiscnent of Two Door Cinema Club or The Temper Trap, San Fernando Valley girls Danielle, Este and Alana loot their parents’ record collection (or mine) that is both contemporary and nostalgic. After the debut EP Forever and stealing the show at SXSW in 2012, the record company wheeled in big-shot producers Ariel Rechtshaid and James Ford, and writers Jessie Ware, with collaborator Kid Harpoon (where do they get these names?) for Days Are Gone. 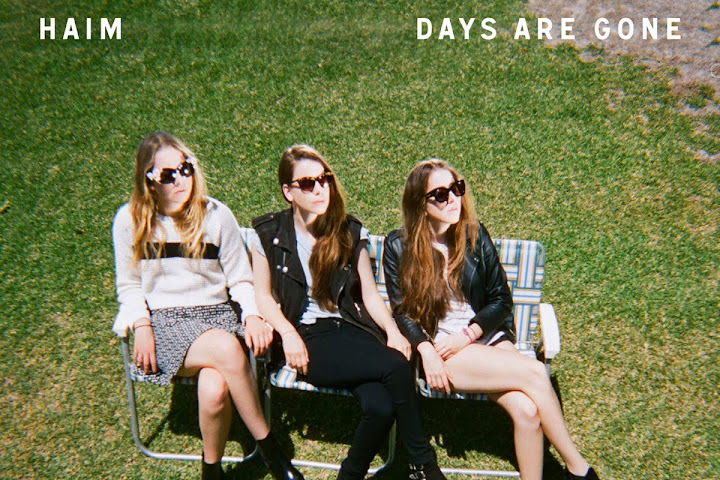 It’s given HAIM a huge commercial boost, but has it cost the band it’s soul? Three strong openers Falling, Forever and The Wire establish Haim’s identity early. Single Falling is a bright, breezy and upbeat slice of West Coast Americana.Forever replays Lindsay Buckingham in layers and reverb, handclaps and extended bridges. The Wire becomes a stacatto Shania Twain country-pop anthem, complete with string section and Auto-Tuned backing. That just – stops. Haim songs don’t hang around, they get in and get out fast, although looking at the running times, they are either three and a half or four and a bit minutes pop parcels. That’s some craft. As for the body of the album, there’s a nostalgia-fest going on. If I Could Change Your Mind makes me think Pat Benatar and any number of soft-pop MOR Billboard Chart fodder, wrapped with the kind of glittery synths that wouldn’t be out of place on a Whitney Houston track. Honey: Fleetwood Mac. Honestly. Don’t Save Me suggests Joan Jett occasionally peeking out from under Haim’s fringe. Days Are Gone – a bit Thriller-ish, if you believe it. My Song 5 goes for a serious change of mood; it’s a raw stripped down chant, Janet Jackson from the Control album. Go Slow, that repeated syllable Heat in the bridge propels it into a Wilson-Pickett chorus, while Let Me Go is a cry for freedom that echoes Florence + The Machine in Celebrations. The thundering drums on Running If You Call My Name is pure Phil Collins, while the vocals and arrangements are Natasha Khan’s Bat for Lashes. Send Me Down turns the mood again, an experimental Prince track circa 1998. Edge is still the perfect mid-tempo ballad. Maybe Heart wrote the lyrics and sold the t-shirt twenty years ago, it’s still a standout track. If there’s any reservation, it’s that all these clever boys with their studio toys have interfered a little too much with the rock-out sisters. On my edition, there’s a Falling remix by dance-king Duke Dumont. Is that really necessary? If you have it, check out the contrast with the demo version of Go Slow, imperfect, untuned and unadorned, almost-as-live, and a clue to Haim’s indie roots. Overall I can’t say I liked the album much. While it’s not the worst album I’ve heard in years, its definitely not the best. I feel the lyrics have gone downhill a bit, and the delightful sound is gone. I will mention though that the production value is amazing. It’s clean, but it’s too clean.